I am always looking for photo opportunities. 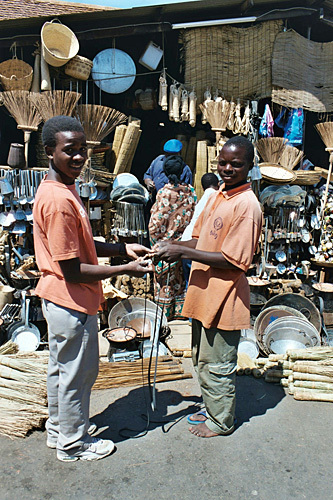 On a stroll through the town of Iringa in Tanzania, I met these two boys at work. The razor blade slit through the rubber. Two young men were cutting up tires into long strings of rubber, because they make excellent carrier straps for bikes. One of the boys looked at me, pointed at my camera then at himself and his friend. I nodded. After some consultation with his chum, he wrote his address in long stocky letters on a grubby piece of paper. I do not know if he ever received his picture. Very interesting. Never imagined that as a use for old tires. I hope the photo ended up making it to them. What a great story - I do hope the young man received his photo - he would be so proud of it!